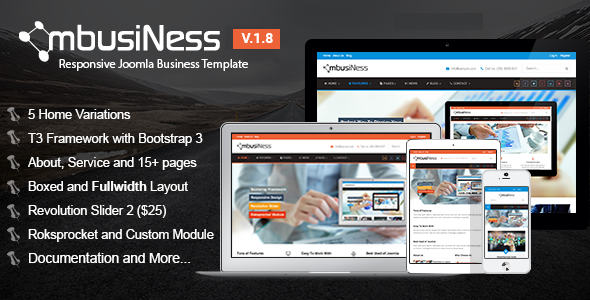 MbusiNess is a stylist, clean and professional Joomla template powered by T3V3 Framework. This template allows you to highlight your company and staff, the services you offer and the projects you are currently involved in. Some of the more important features included are: Real world About, Service, Team, Pricing, Contact pages and News section with Joomla article. It has K2 powered blog, Revolution Slider 2, Roksprocket Module and so on. Take the experience first, You don’t need to worry about profit !! # All required extensions up to date. # Fixed some css issues.